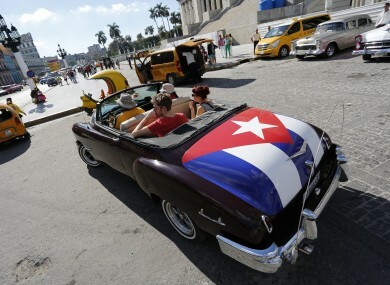 Tourists take a ride in a classic convertible in Havana. BANK OF IRELAND refused a payment between an Irish couple because the transfer slip was marked ‘Cuba flights’. The woman attempted to make the payment to her partner earlier this month – as the pair had booked a holiday to the Caribbean country for later this year. The man had paid for the flights, and they had arranged that she would transfer €400 to his account, at Bank of Ireland’s Eyre Square Branch in Galway. As she did so, she wrote the two-word note saying what the money was for, in the space provided. A few days after his partner had told him she transferred the money, the bank customer got a call from his branch. “A very nice lady from Bank of Ireland called and asked what the transaction was all about,” he told TheJournal.ie. I told her it was money for a flight to Cuba. In response, she said “Bank of Ireland don’t allow any transaction to occur in relation to Cuba”. He questioned the move, but was told it was bank policy. I told her it was ridiculous that that was their policy. Bank of Ireland banned business transactions to and from Cuba last summer, due to a business relationship it has with a US bank. It later emerged that the restrictions were also being applied to personal customers. While Ireland does not have any restrictions on trade in Cuba, a US embargo has been in place since Fidel Castro overthrew the island’s pro-American regime in the 1960s. In this case, however – neither party is based in Cuba. The couple live and work in the greater Dublin area. In response to a query from this website, Bank of Ireland said it couldn’t discuss the details of any transactions with anyone other than the account holder. “In relation to Cuba, as the bank has previously stated, the US Government has a restrictive trade embargo against Cuba which includes an embargo on making or receiving payments to/from Cuba and/or facilitating the making or receiving of payments to/from Cuba. As a result the bank is not in a position to process such transactions. Asked about the Bank of Ireland restrictions recently, Foreign Affairs Minister Charlie Flanagan said Ireland and the EU had “firmly and continuously opposed extraterritorial measures that seek to extend the US’s embargo against Cuba to third countries as contrary to commonly accepted rules of international trade”. The issue was raised in talks with the US State Department last year. “We drew their attention to the impact of the legislation on business and others in Ireland, and recalled our position on the relevant legislation. We are currently in the process of following up further with the US side in the matter. Email “Bank of Ireland wouldn't accept couple's Cuba holiday money ”. Feedback on “Bank of Ireland wouldn't accept couple's Cuba holiday money ”.